Hypoglycemia is a deadly disease caused by, lowering of the blood sugar, below the physiological limits and can endanger life if not treated promptly. Physicians come across Hypoglycemia very often and the topic has been discussed, detailed and stated by a number of international Diabetic Associations. In 2013, a work group of the American Diabetes Association (ADA) and the Endocrine Society reconfirmed previously published criteria for the definition and clinical classification of hypoglycemia in patients with diabetes mellitus. In patients with diabetes, hypoglycemia is defined as all episodes of an abnormally low plasma glucose concentration (with or without symptoms) that expose the individual to harm . The workgroup recommended that people with diabetes become concerned about the possibility of hypoglycemia at a self-monitored blood glucose (SMBG) level ≤70 mg/dL (3.9 mmol/L). While that value is higher than the value used to diagnose hypoglycemia in people without diabetes, it approximates the lower limit of the physiological fasting non diabetic range, the normal glycemic threshold for glucose counte rregulatory hormone secretion, and the highest antecedent low glucose level reported to reduce sympathoadrenal responses to subsequent hypoglycemia. 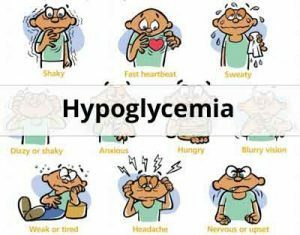 Severe hypoglycemia – An event requiring the assistance of another person to actively administer carbohydrate, glucagon, or other resuscitative actions is classified as a severe hypoglycemic event. Plasma glucose measurements may not be available during such an event, but neurologic recovery attributable to restoration of plasma glucose to normal is considered sufficient evidence that the event was induced by a low plasma glucose concentration. Documented symptomatic hypoglycemia – An event during which typical symptoms of hypoglycemia are accompanied by a measured (typically with a monitor or with a validated glucose sensor) plasma glucose concentration ≤70 mg/dL(3.9 mmol/L) is classified as a documented symptomatic hypoglycemic event. Asymptomatic hypoglycemia – Asymptomatic hypoglycemia is classified as an event not accompanied by typical symptoms of hypoglycemia but with a measured plasma glucose concentration of ≤70 mg/dL (3.9 mmol/L). Probable symptomatic hypoglycemia – Probable symptomatic hypoglycemia is classified as an event during which typical symptoms of hypoglycemia are not accompanied by a plasma glucose determination (but that was presumably caused by a plasma glucose concentration ≤70 mg/dL [3.9 mmol/L]). Pseudohypoglycemia – Pseudohypoglycemia is classified as an event during which the person with diabetes reports typical symptoms of hypoglycemia, and interprets those as indicative of hypoglycemia, but with a measured plasma glucose concentration >70 mg/dL (3.9 mmol/L). This category reflects the fact that patients with chronically poor glycemic control can experience symptoms of hypoglycemia at plasma glucose levels >70 mg/dL (3.9 mmol/L) as glucose levels decline into the physiological range. Type 1 diabetes — Hypoglycemia occurs frequently in patients with type 1 diabetes. The average patient suffers countless numbers of episodes of asymptomatic hypoglycemia (which are not benign because they impair defenses against subsequent falling plasma glucose concentrations), two episodes of symptomatic hypoglycemia per week, and one episode of temporarily disabling hypoglycemia per year . Severe hypoglycemia events, the most reliable values albeit representing only a small fraction of the total hypoglycemic experience, have been reported to range from 62 to 320 episodes per 100 patient years in type 1 diabetes . In the Diabetes Control and Complications Trial (DCCT), a greater proportion of patients in the intensively treated group had at least one episode of severe hypoglycemia (65 versus 35 percent of patients in the control group), with overall rates of 61 and 19 per 100 patient-years, respectively . Among the commonly used insulin secretagogues (sulfonylureas, meglitinides), hypoglycemia is most often reported in patients taking long-acting drugs, such as glyburide(glibenclamide) . Hypoglycemia is relatively uncommon during treatment with insulin early in the course of type 2 diabetes. However, its frequency increases, approaching type 1 diabetes, as patients approach the insulin deficient end of the spectrum of type 2 diabetes. The prevalence of mild hypoglycemic symptoms has been reported as 16 to 20 percent in patients using sulfonylurea agents, and 30 to 50 percent in patients treated with insulin . Hypoglycemia is an important problem in type 1 diabetes and in patients with type 2 diabetes who have more profound degrees of insulin deficiency . It can cause a vicious cycle of recurrent hypoglycemia, resulting in morbidity and preventing the maintenance of euglycemia over a lifetime [1-3]. In addition, hypoglycemia can be fatal, with hypoglycemia mortality estimates ranging from 4 to 10 percent of deaths of patients with type 1 diabetes . Hypoglycemia mortality rates in type 2 diabetes are currently unknown, but fatal hypoglycemia has been documented in type 2 diabetes .Severe hypoglycemia may also be associated with an increased risk of cardiovascular disease in patients with type 2 diabetes . Older adults — The risk of hypoglycemia is related to the duration of diabetes and appears to be increased in older adults . Older adults may have more neuroglycopenic manifestations of hypoglycemia (dizziness, weakness, delirium, confusion) compared with adrenergic manifestations (tremors, sweating). Severe hypoglycemia requiring hospitalisation has been associated with an increased risk of dementia. Furthermore, older adults with diabetes who develop dementia have a higher risk of hypoglycemia . In addition, even mild episodes of hypoglycemia may lead to adverse outcomes in frail older adults; episodes of dizziness or weakness increase the risk of falls and fracture leading to nursing home placement. Asymptomatic — When self-monitoring of blood glucose (SMBG) reveals a blood glucose of ≤70 mg/dL (3.9 mmol/L), it is reasonable for a person with drug-treated diabetes to consider defensive actions. The options include repeating the measurement in the near term, avoiding critical tasks such as driving, ingesting carbohydrates, and adjusting the treatment regimen . Symptomatic — In order to treat early symptoms of hypoglycemia, patients should be certain that fast-acting carbohydrate (such as glucose tablets, hard candy, or sweetened fruit juice) is available at all times. Fifteen to 20 grams is usually sufficient to raise the blood glucose into a safe range without inducing hyperglycemia. This can be followed by long-acting carbohydrate to prevent recurrent symptoms. In patients taking insulin or an insulin secretagogue in combination with an alpha-glucosidase inhibitor (acarbose, miglitol, voglibose), only pure glucose (dextrose) should be used to treat symptomatic hypoglycemia. Other forms of carbohydrates, such as table sugar (sucrose), will be less effective in raising blood sugar as alpha-glucosidase inhibitors slow digestion of other carbohydrates. Severe — Treatment of severe hypoglycemia, when the patient is unconscious or unable to ingest carbohydrate, requires that close friends or relatives be trained to recognize and treat this complication. Dealing with a loved one who is pale, sweaty, acting in a bizarre fashion, or unconscious and convulsing is often a terrifying situation, yet one that can be reversed with an injection of glucagon. Successful glucagon therapy requires that the glucagon kit can be located and that the relative or friend is able to remain calm, mix the glucagon powder with the diluent, draw it up, and give the injection. The glucagon kit should be checked regularly and replaced when it is beyond its expiration date. An intranasal formulation of a glucagon powder is under investigation . The dose can be delivered by placing the tip of the device in one nostril and depressing a small plunger that discharges the powder into the nostril without need for inhalation or other cooperation from the patient. In a randomized crossover trial comparing intranasal (3 mg) and intramuscular (1 mg) glucagon in 77 patients with type 1 diabetes and hypoglycemia (induced in a controlled setting by administering insulin), successful reversal of hypoglycemia occurred in 98.7 and 100 percent of intranasal glucagon and intramuscular glucagon visits, respectively . Mean time to success was slightly longer for intranasal than intramuscular administration (16 versus 13 minutes). A subcutaneous or intramuscular injection of 0.5 to 1.0 mg of glucagon will usually lead to recovery of consciousness within approximately 15 minutes, although it may be followed by marked nausea or even vomiting. Patients brought to the hospital can be treated more quickly by giving 25 g of 50 percent glucose (dextrose) intravenously. A subsequent glucose infusion (or food, if patient is able to eat) is often needed, depending upon the cause of the hypoglycemia. There are no efficacy or safety data to guide the management of severe hypoglycemia (while awaiting emergency personnel) in patients with impaired consciousness and no immediate access to glucagon or intravenous (IV) dextrose. In a study of normoglycemic volunteers, the buccal absorption of glucose was minimal . However, in the absence of other options for such patients, some experts, including some UpToDate authors and editors, suggest that while awaiting emergency personnel, family members squeeze a glucose gel (eg, Insta-Glucose) or cake frosting in the space between the teeth and buccal mucosa, keeping the patient’s head tilted slightly to the side. If a glucose gel or cake frosting is unavailable, some advocate sprinkling table sugar under the tongue, as table sugar has been reported to raise plasma glucose concentrations to some extent in ill children with malaria . It is recommended to have evaluation and management of hypoglycemia only in patients in whom Whipple’s triad–symptoms, signs, or both consistent with hypoglycemia, a low plasma glucose concentration, and resolution of those symptoms or signs after the plasma glucose concentration is raised–is documented. In patients with hypoglycemia without diabetes mellitus, we recommend the following strategy. First, pursue clinical clues to potential hypoglycemic etiologies–drugs, critical illnesses, hormone deficiencies, nonislet celltumors. In the absence of these causes, the differential diagnosis narrows to accidental, surreptitious, or even malicious hypoglycemia or endogenous hyperinsulinism. In patients suspected of having endogenous hyperinsulinism, measure plasma glucose, insulin, C-peptide, proinsulin, beta-hydroxybutyrate, and circulating oral hypoglycemic agents during an episode of hypoglycemia and measure insulin antibodies. Insulin or insulin secretagogue treatment of diabetes mellitus is the most common cause of hypoglycemia. Guidelines recommend the practice of hypoglycemia risk factor reduction–addressing the issue of hypoglycemia, applying the principles of intensive glycemic therapy, and considering both the conventional risk factors and those indicative of compromised defenses against falling plasma glucose concentrations–in persons with diabetes. Hypoglycemia and diabetes: a report of a work group of the American Diabetes Association and the Endocrine Society.AUSeaquist ER, Anderson J, Childs B, Cryer P, Dagogo-Jack S, Fish L, Heller SR, Rodriguez H, Rosenzweig J, Vigersky R, American Diabetes Association, Endocrine Society SO J Clin Endocrinol Metab. 2013;98(5):1845. Hypoglycemia in the Diabetes Control and Complications Trial. The Diabetes Control and Complications Trial Research Group. AUSO Diabetes. 1997;46(2):271. Evaluation and management of adult hypoglycemic disorders: an Endocrine Society Clinical Practice Guideline. AU Cryer PE, Axelrod L, Grossman AB, Heller SR, Montori VM, Seaquist ER, Service FJ, Endocrine Society SO J Clin Endocrinol Metab. 2009;94(3):709. Association between hypoglycemia and dementia in a biracial cohort of older adults with diabetes mellitus. AU Yaffe K, Falvey CM, Hamilton N, Harris TB, Simonsick EM, Strotmeyer ES, Shorr RI, Metti A, Schwartz AV SOJAMA Intern Med. 2013 Jul;173(14):1300-6.